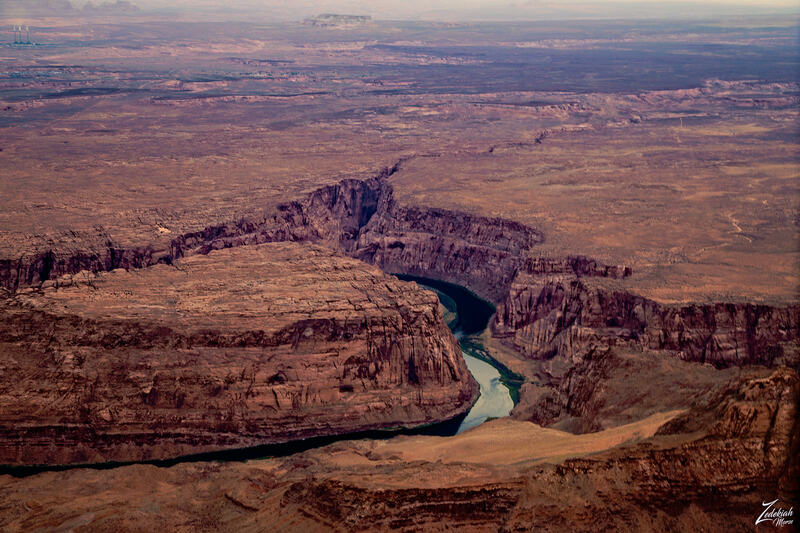 Lake Powell and Page Arizona sit beside the Colorado River where it enters Glen Canyon and begins it’s dramatic descent into Marble Canyon and eventually the Grand Canyon. This deep canyon is the beginning of the deepening cut the river has made over eons, slicing into the rock to become the mighty Grand Canyon. This is Glen Canyon and it is the location of the beginning of the Grand Canyon National Park. 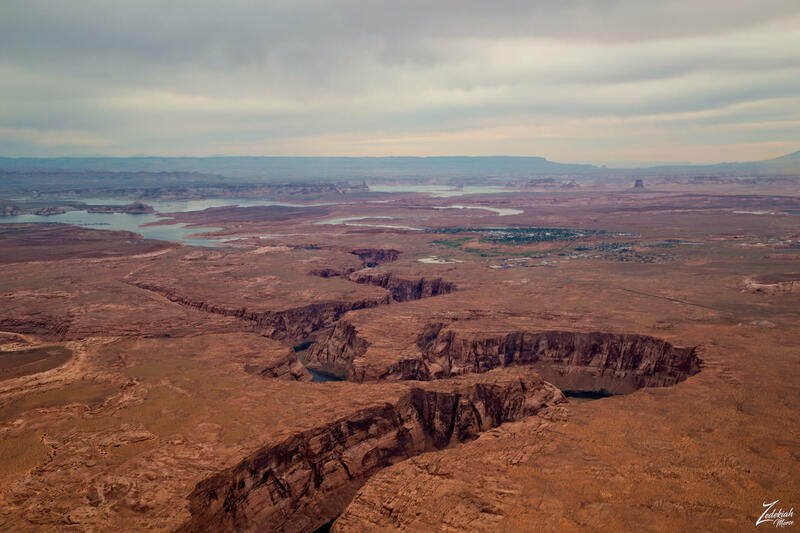 To the top and left is Lake Powell and the Glen Canyon Recreation Area and to the right of the river and lake is Rainbow Plateau and the Wild Horse Mesa on the First Nations Dine (Navajo) Reservation. In the distance on the right side of the horizon lies Tower Butte over Horseshoe Bend. The image above is looking to the east from directly above Pariah Canyon and the image below is looking to the west from the same position. 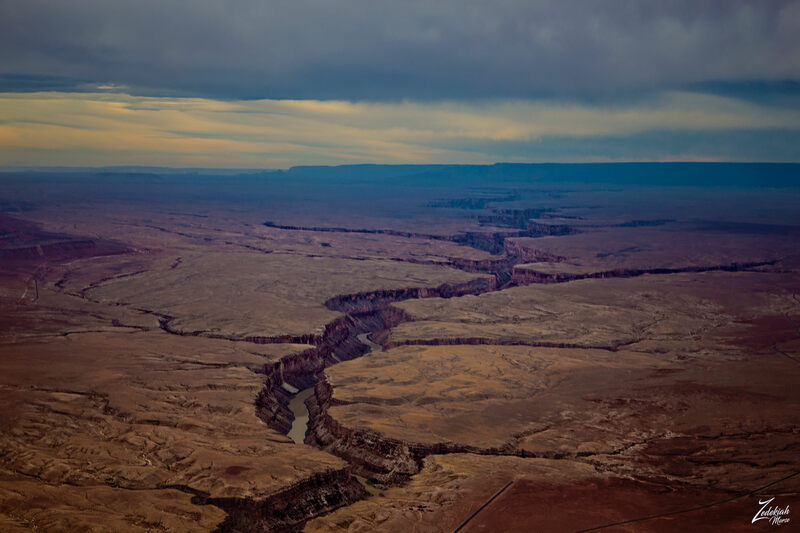 Here, Marble Canyon carves its way across the House Rock Valley, becoming the Grand Canyon. Looking back towards the east at Glen Canyon this is the big bend in the river near Lees Ferry. In the bottom right side of this image along the river is a large overhang in the Navajo Sandstone next to the Colorado River, this is known as Hislops Cave. It is named after the inscription found carved in the ceiling of the overhang which reads “Hislop 1889”. There is an interesting story about Hislops Cave; In 1889 Robert Brewster Stanton and Frank Brown organized a river expedition starting in Green River, Wyoming. They were part of a company called the “Denver, Colorado Canyon and Pacific Railroad Company”. Bob Stanton was an engineer, and Frank Brown was CEO of the company. John Hislop was on the trip as well and carved his name into the cave, which is why it has been called Hislop Cave ever since. Frank Brown drowned just downstream from Lees Ferry, in Marble Canyon, near Soap Creek Rapid (in a small riffle), a few days after Hislop made his inscription. Ironically it was Frank Brown who had insisted they not spend money on life jackets. Two more members of the river party drowned soon after, and the expedition was abandoned at Vasey’s Paradise and their equipment was stashed in what is now known as Stanton’s Cave at Mile 32 in Grand Canyon. They then hiked out at South Canyon. Stanton organized a second expedition soon after, and the railroad survey was completed. However, needless to say, this part of the railroad planned to go from Green River, Wyoming down the Green River to the Colorado River, through Glen Canyon and Grand Canyon, was never built. 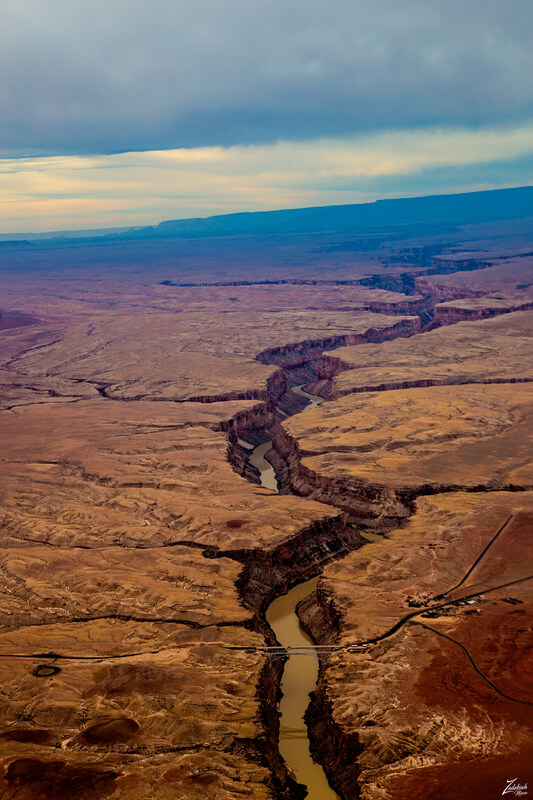 In this image below you can see the Navajo Bridge where Highway 89 crosses the Colorado River. This is the only bridge crossing over the Colorado River until it reaches the Hoover Dam on the other side of the Grand Canyon.